I’m sitting here safely in Italy thinking and purraying for all of my dear furiends in the path of Irma. I’ve never seen anything like her and I wish I could do something to help. The humans and I have many furiends across the affected region that are being evacuated at the moment. Our dear furiend Paul lives right underneath the projected eye of the storm in Florida. He has been evacuated and I have my paws crossed that his boat will survive. We are all purring for evfurrybody and of course all of the animals that will have to use their best survival skills over the coming weeks. There are many fellow sailing bloggers who we love and admire who are also facing losing their beloved homes. My heart breaks for them at the moment. 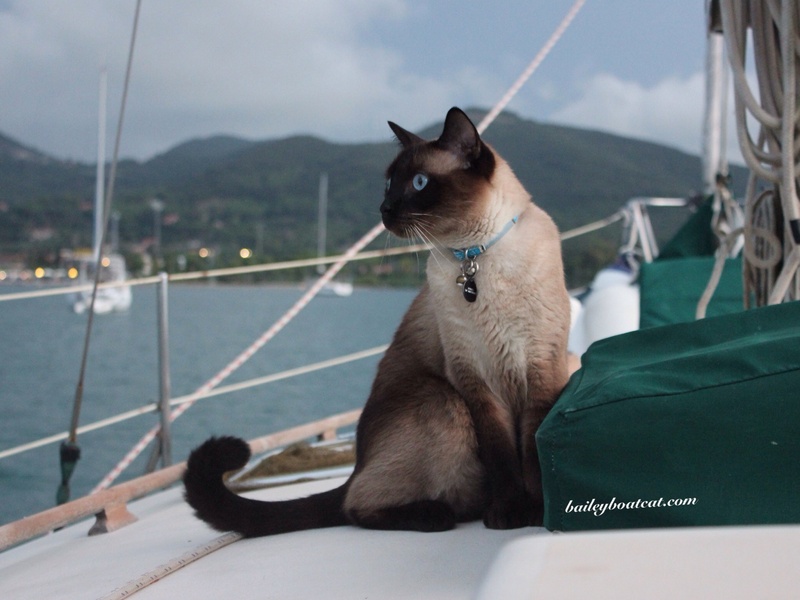 A special purr and shout-out to the PAWESOME Windtraveler crew who I’m so thankful have safely evacuated but have had to leave their beautiful floating home behind. I’m a huge fan of Isla, Haven and Mira, the fierce young ladies aboard, their parents Brittany and Scott seem lovely too, but I’m pretty sure that the girls are the collective Admirals! I have my paws crossed to meet them one day. Please send these little ladies your well wishes furiends. I hope all of you are staying safe and that Irma calms down as quickly as possible. « Nocturne has had a big day! We have our hatches battened down (figuratively speaking) Here in Jacksonville we are expecting Irma on Monday. We are still evaluating whether to stay or take refuge at our home in the mountains of North Carolina. Dad has all the carriers ready and says that whether he likes it or not Henri our neighborhood Kitty is coming inside and if we evacuate he’s coming to North Carolina. Henri visits several neighbors and is fed by all of them. During Hurricane Matthew, Dad made him come inside and he complained throughout the storm. The only time he wasn’t meowing was when he was eating or when dad was brushing him. 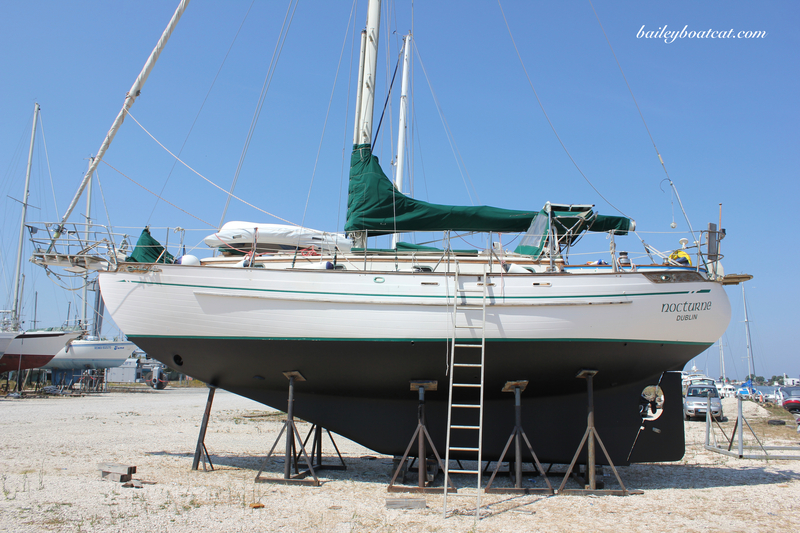 Our little Pocketship, “Miss Talley” has her mast laid down and is safely berthed in the Garage. It’s so heart wrenching to see Harvey, and now Irma! Makes me kind of angry too. Such a scary storm. We are in southeast Virginia, so we, too, are praying that Irma decides to take a sharp turn out to sea. Thank you for your good wishes, Bailey, for all of our friends and furiends who are in the path of several impending hurricanes and storms. Irma is just one! We are glad YOU are safe, dear fellow! Fangu, Mr. Bailey. We are caretaking kitties in South Florida and we are carefully snoopervising our humans as they prepare for the hurricane. We make sure they are never alone and that we are always purring for them. We have so many pals in Florida too – and we’re SO worried about them! All of us are worried about our friends and family in Florida…..Irma is a HUGE storm. You are sweet to send prayers and good wishes for everyone Bailey. Paws crossed that Irma will not destroy any of your boating friends beautiful boats……and that everyone else on shore stays SAFE. I just hope Irma fizzles a bit, and arrives all tamed down.